This tutorial will show you how to redirect your affiliate links using a PHP script and a simple edit to your .htaccess file. For some reason users seem to trust links more if the reside on your own server. Using a “link cloaking” technique is an easy way to increase revenue from affiliate offers. For this tutorial we will use the website www.scholarshiphunter.info for example. On the left navigation menu you will see an affiliate section. If you mouse over you will notice that the link goes to a folder on the site called links. It may sound difficult, but it is really very simple. First create the PHP file that will redirect the links to the appropriate affiliate offers. You can do this in notepad if you don’t have an editor of choice, however I will use Dreamweaver because I like the way it colors the code. Basically the only things that you need to change are the link variable and the affiliate link. The link variable is the “folder” that you want the link to be sent to on your server. The affiliate id is the affiliate link provided by your affiliate company. The bottom section of code simply gets the id variable from the browsers and redirects you to the affiliate offer, using a header redirect. 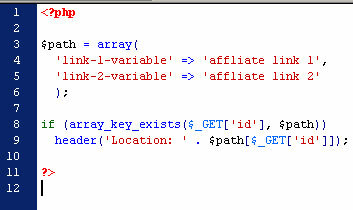 Create to file, replacing the variable and the afflaite links with your own, and save it as link.php. Upload this file to the root of your web directory on your server. Just remember that when you edit the file, do not include a comma on the last affiliate link offer. That code simply tells the server to rewrite any url that is calls the folder /links/yourvariablehere to the real link.php?id=yourvariblehere. This all happens in the background so the users sees the /links/yourvariblehere link. It is really that easy, now go make some money! Worked perfectly on my domain magazine! thank you very much. Excellent tutorial, works perfectly!! Many thanks! I tried your tutorial on my website, but it did not work. I understand about the separate .php file, and that works without a hitch. But where things get messy is utilizing the .htaccess file in order to redirect a search engine friendly url to the actual .php page. The steps you gave do not work for me. I’ve tried a couple different variations, but have not had luck. It seems as though it is not able to transition from the search engine friendly url to the .php url. A few people are having problems with this. I do not use this method on my blog because I have other .htaccess mods and I am not a .htaccess expert. I do know that this does work on my scholarshiphunter.info website. For this website (teamtutorials) I simply created a folder. In that folder a create a folder for each offer. Then a just create an index.php file that is just one redirect. So the url for copeac would be http://www.teamtutorials.com/go/copeac/ . This is the easiest way that you can redirect with clean url’s. Hope that will solve some of the problems guys. Did you notice that you misspelled “affiliate” as “affliate”? The Scholarship Hunter site misspells it right in the picture you’ve shown here. Team Tutorials misspells it in the sidebar link for Copeac. I do it all the time. For some reason I can’t type affiliate right. Does this drop cookies or effect them in anyway? I use the simple php header redirect as stated in a comment here and since implementation my sales have really dropped. Worried its blocking cookies somehow!? Ops, forgot to mention. It’s http://www.acloaker.com. Thanks. I keep getting a ‘no input file specified’ error. Where do we add these lines of code to? Do we copy the exact lines? Ron in order for the mod rewrite to work, you would have to have the .htaccess in a folder and that folder would also need to contain link.php. It is hard to troubleshoot without seeing how your links are structure. Feel free to fill out the contact form to email us if you want some additional help. Very good tutorial, thank you! great tutorial, thanks for the tip! Hey thanks for this simple yet effective strategy! I quickly implemented this on a couple of my blogs. Is there any way to 100% mask the referrer id? My site is setup to support hundreds of affiliate links stored in a MySQL database. I pull the links with a recordset into a repeat region as well as with a dynamic list/menu (using Dreamweaver & PHP). Each link is stored in it’s own record along with affiliate name, etc. Any suggestions how to modify what you outlined in the tutorial. This tutorial really helps me alot. Thanks for the effort of having the tutorial. This post has an insanely high amount of spam. I am disabling comments. Please use the contact form if you have questions on this.